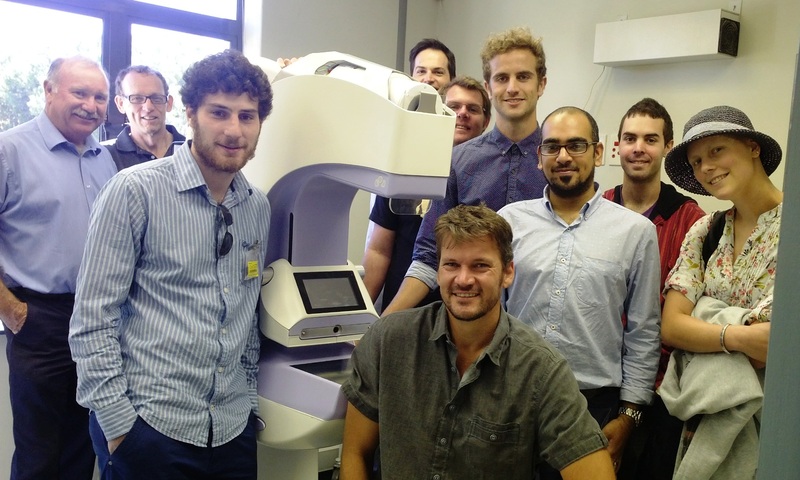 Last Friday 4 April 2014 marked a significant milestone at CapeRay with the launch of a clinical trial to put our pioneering dual-modality imaging system known as Aceso through its paces. We simultaneously gathered full-field digital mammography (FFDM) and 3D automated breast ultrasound (ABUS) images of our first volunteer subject. There were four sets of images: cranio-caudal (CC) and mediolateral-oblique (MLO) views of the left and right breasts. 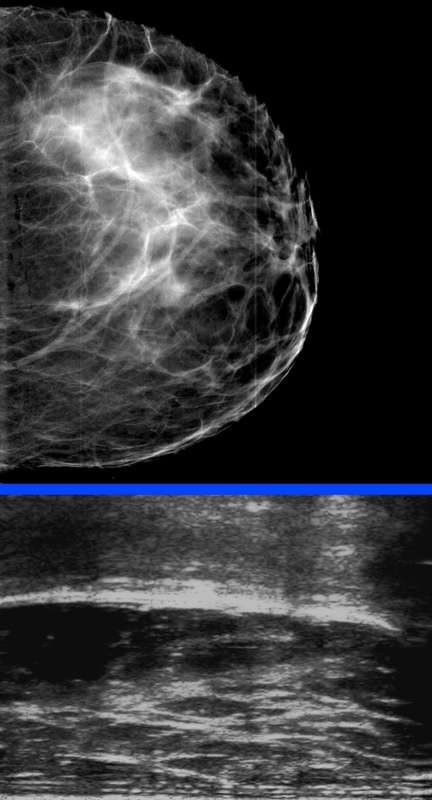 Seen at right is a CC view of the right breast (FFDM) and below it is a sagittal plane slice from the corresponding ABUS data set. The rationale behind Aceso is the recognition that although FFDM is the gold standard for diagnosing breast cancer, it does a relatively poor job when the patient has dense breast tissue so malignant tumours are often not seen. To avoid these false negative reports — which can have devastating consequences for the women concerned — clinicians have turned to ultrasound that does a better job at penetrating dense glandular tissue. In a screening environment dense breast tissue is normally identified with FFDM and the woman will then be invited for a follow-up examination using either hand-held ultrasound or the newer ABUS approach. In addition to the inconvenience of a return visit to the clinic, the extra test can take anywhere from 20 to 30 minutes. This is a major advantage of Aceso: in just 10 minutes it simultaneously gathers both FFDM and ABUS images with the breast in the same orientation and degree of compression. The original idea to combine digital X-rays and 3D ultrasound in a single instrument was conceived in January 2010 so it has taken us four years to move from concept to reality. Along the way we have secured ISO 13485 certification for the company, a CE Mark for Pandia, our digital X-ray camera, and conducted a clinical trial of Soteria, our FFDM-only system. Integration of ABUS has proved to be a challenge but during the past year a dedicated and talented team (see below) has come together and brought Aceso to life. Our clinical trial of Aceso will run until the end of April, during which period we will have studied 50 healthy volunteers as well as a few patients with confirmed breast cancer. Aceso is the Greek goddess who personifies the healing process and we are optimistic our dual-modality system will ultimately have a positive impact on early detection of breast cancer and its successful treatment. Thanks for the positive feedback, Ard and Bronwyn. These are indeed exciting times for our team! What a moment – the hard work continues. Keep it up and good luck. We are all watching this space.